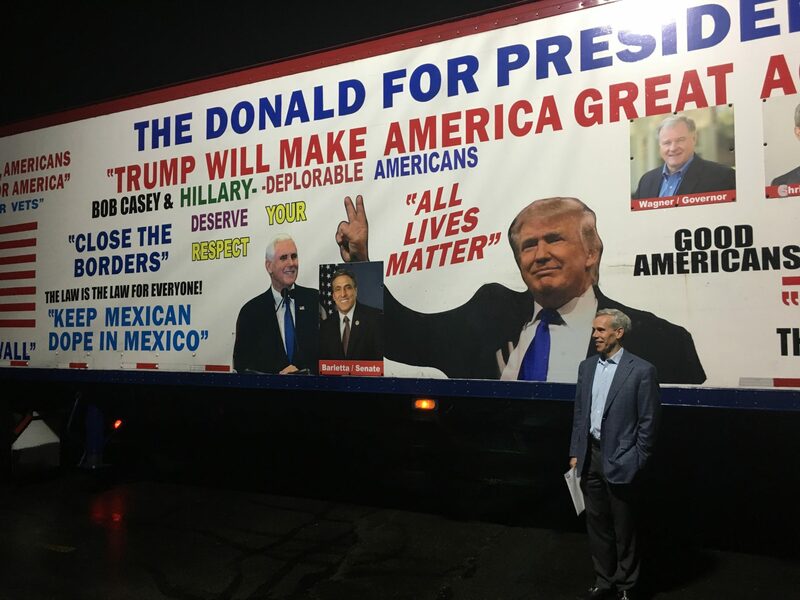 Republican congressional candidate John Chrin poses for a picture in front of a Donald Trump-themed tractor-trailer on Sept. 12, 2018 in Luzerne County. Scott Wagner is often compared to Donald Trump. Can he get the same voters? In 2016, the line was long when Keith Gould left the polls for lunch. It was even longer when he came back to his station outside Hazleton. That’s when Gould says he realized something: Donald Trump was going to be the country’s next president. Gould’s a Republican committeeman in Luzerne County, one of three Pennsylvania counties that Trump flipped from Democrat to Republican on his way to winning the state two years ago. Gould, a 54-year-old real estate agent, expects the November election to be a referendum on Trump in many ways. Volunteers from the University of Pennsylvania gather at a Democratic campaign office in Easton on Sept. 15, 2018. Or maybe not so tight. Right now, polls show that the two main statewide Republican candidates — Wagner for governor and Lou Barletta for Senate — trail by double digits. Gould thinks that to defeat incumbent Democratic Gov. Tom Wolf, Wagner needs to win Luzerne County, and that he has a good chance of doing so. It could come down to a question of voter enthusiasm: Can Republicans repeat their 2016 victories in Luzerne County and places like it without Trump at the top of the ticket? Trump was the first Republican presidential candidate since 1988 to win Pennsylvania. And he did that, in part, by flipping Erie County in northwestern Pennsylvania, Luzerne in the northeast, and Northampton in the Lehigh Valley. With less than eight weeks before the Nov. 6 election, a visit to two of those three counties — Luzerne and Northampton — finds Democratic volunteers who are afraid of a 2016 repeat, a Republican candidate for governor who’s worried about complacency, Democrats who see the state as key to taking back the U.S. House, and at least one Republican who likes both Trump and Wolf. In Luzerne County, the blame falls at the local, state and national level, said John Pekarovsky, who was recently elected as chairman of the Luzerne County Democratic Party. “We kind of fell asleep at the switch,” he said. Earlier this year, there was a very public metaphor for the Trump takeover of Luzerne. Pekarovsky was angry about the websites. He said, from what he understands, two high school students who were frustrated with local Democrats were responsible. He said another Luzerne County Democrat met with them and “paid whatever they paid” to get the sites back. “They were just happy that we extended an olive branch and offered to bring them in,” Pekarovsky said. 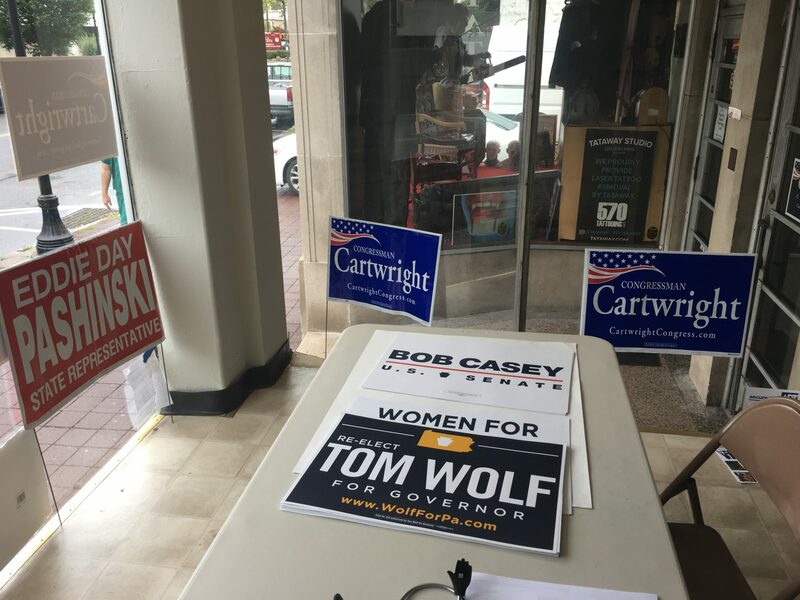 At a Democratic campaign office in Wilkes-Barre last week, Alisha Hoffman-Mirilovich made phone calls for Democratic Congressman Matt Cartwright’s campaign. Her 8-month-old son sat on her lap. She was a volunteer with Hillary Clinton’s 2016 campaign. After that loss, she helped found Action Together NEPA, a community and political advocacy organization. And in May, she was elected to the Pennsylvania Democratic State Committee. She said she’s working as hard as she can to make sure Luzerne County goes Democratic this time. 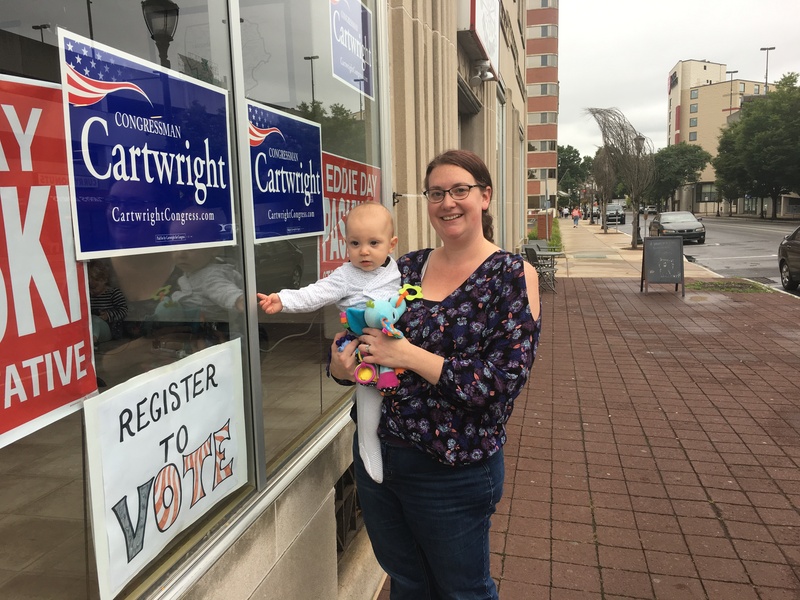 Democrat Alisha Hoffman-Mirilovich stands outside a campaign office in Wilkes-Barre on Sept. 12, 2018, while holding her son. Cartwright and his Republican opponent, John Chrin, offered similar explanations for why Luzerne flipped in 2016: The economy. The median household income in Luzerne County is about $8,300 less than it is statewide, and the unemployment rate is higher, too. Cartwright said he expects a big win for Wolf this time, though. And he pointed to a 2017 decision by Wolf, when the administration was considering closing state prisons, as one reason. In the end, the Wolf administration kept facilities open in northeastern Pennsylvania. “People remember that Gov. Wolf kept us in mind during that crisis,” Cartwright said. 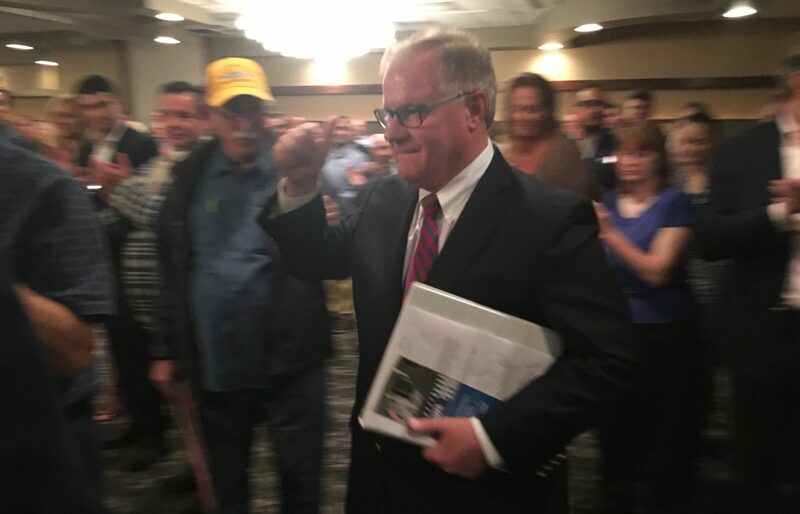 Republican gubernatorial candidate Scott Wagner greets a crowd at a rally on Sept. 12, 2018. In early August, Wagner joined Trump at a rally at Mohegan Sun Arena in Wilkes-Barre. And on a Wednesday evening last week, Wagner returned to Luzerne County for a rally on his own. There was a crowd of about 200 to 250 people at a banquet hall at The Woodlands. A large tractor-trailer with images of Wagner, Trump and other Republicans was parked outside. It had messages: “Close The Borders” and “All Lives Matter” and “Keep Mexican Dope In Mexico” and more. Inside, Chris Kuehl joked that he needed a Wagner T-shirt. Kuehl and Wagner — no relation to the candidate — described themselves as former Democrats and one-time supporters of U.S. Sen. Bernie Sanders who shifted toward Trump. They live in neighboring Lackawanna County, which Obama won by 27 points in 2012 and Clinton won by 3 points in 2016. In the governor’s race, they’re committed to Wagner. Kuehl criticized Wolf for allowing budgets to go into effect without his signature and for the state of the roads and education system. “It’s not just Tom Wolf. You look at cities and states that are Democrat-run all across the country — they are disasters,” said Kuehl, a 40-year-old automation technician. At the rally, there were some references to Trump’s appeal to Democrats and the 2016 election. Frank Scavo, a state Senate candidate, talked about the importance of “good Democrats” in elections and how he spent 30 years trying to get Democrats to register as Republicans. Scavo was referring to changes ahead of the 2016 primary in Pennsylvania. And since November 2016, the percentage and number of registered Democrats has decreased both statewide and in the counties that flipped for Trump. But Democrats still outnumber Republicans statewide and in those counties. 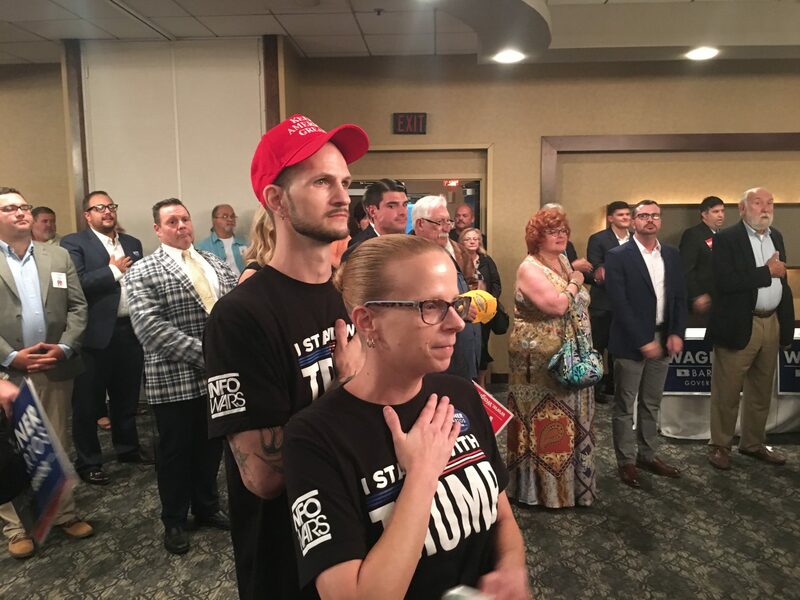 Chris Kuehl, left, and Amy Wagner, right, attended a rally for Republican gubernatorial candidate Scott Wagner on Sept. 12, 2018. Before Wagner took the stage, he told a reporter that his focus on eliminating school property taxes — which would be paid for through a combination of cuts and raising other taxes, his campaign has said — would help him win in places like Luzerne County. During his speech, Wagner told the crowd he was going off script. He said he could smell and see a little complacency around the state, and he was concerned. He compared himself and Trump to people who clean up after raccoons infest your basement. He read an email from a county chairman in northwestern Pennsylvania who said some of the TV ads against Wagner — which Wagner told the crowd weren’t true– were registering “with our GOP voters.” Wagner’s advice to them? Don’t be gullible. “Every time he tells me … that I’m down 14 points, I am more and more determined every day to beat Gov. Wolf,” Wagner told the crowd. 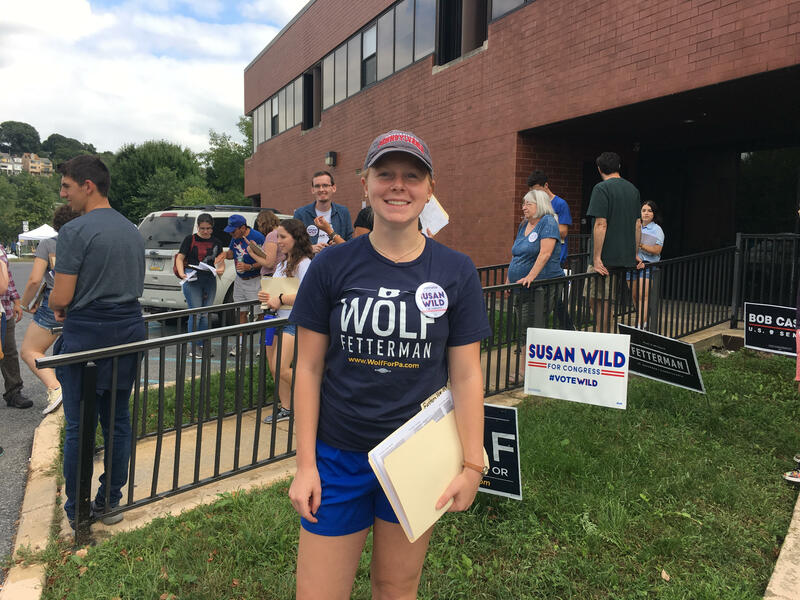 E. J. Carlson, a student at the University of Pennsylvania, traveled to Easton on Sept. 15, 2018, to campaign for Democratic congressional candidate Susan Wild. On a Saturday, about two dozen University of Pennsylvania students traveled to Easton in Northampton County. They were there to knock on doors for Susan Wild, an attorney and Democrat competing for a seat against Marty Nothstein, a Republican county commissioner and former Olympic cyclist, and Libertarian Tim Silfies. Wild told the student volunteers that if Democrats don’t win in the 7th district, they won’t take back the House. In the 2016 election, Pennsylvania Democrats won five out of 18 seats. But new maps, drawn in February by the state Supreme Court after a legal battle over gerrymandering, give the Democrats better odds in races across the state. That might sound oversimplified, but having a Democrat in Congress can help the party build trust with voters, she said. “And then you start seeing results, not only for president in 2020, but for state legislative seats in the Senate and the House of Representatives,” Patton Mills said. 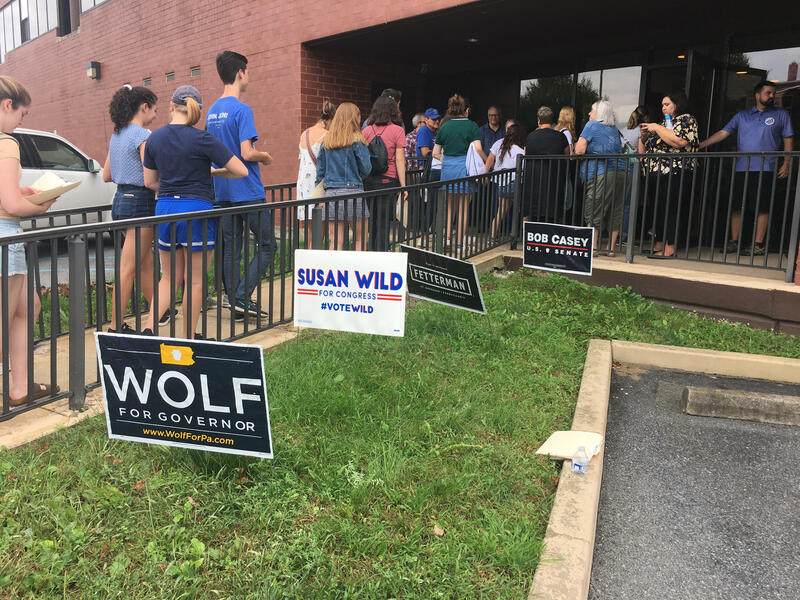 Signs for Democratic candidates are seen at a campaign office in Wilkes-Barre on Sept. 12, 2018. Tom Krause has plenty of opinions about Trump. Krause is a 64-year-old Republican who lives outside Easton. He says he’s retired from the real estate business. He voted for Trump and considered him to be an independent candidate. He likes the president’s position on trade agreements, and he would vote for Trump again. 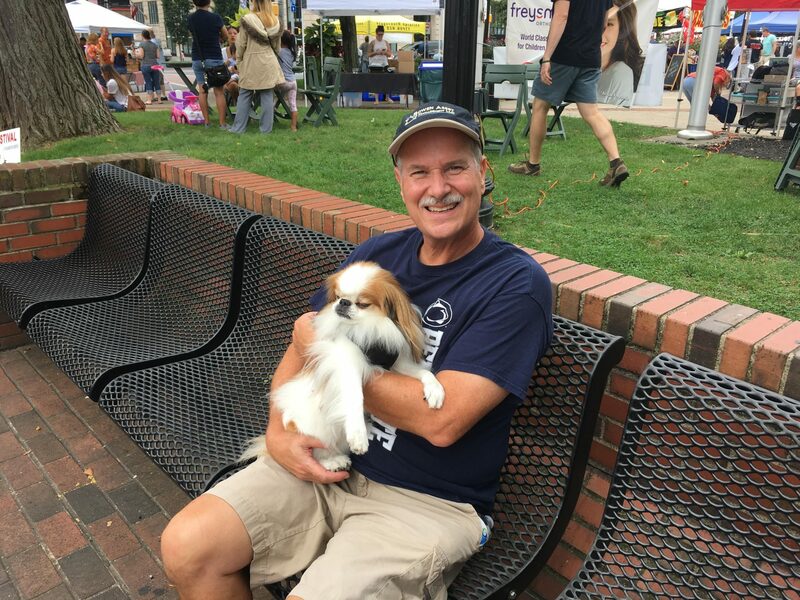 “I don’t like his political incorrectness but that’s a price you pay to get something done apparently,” Krause said, while sitting at Easton Farmers’ Market, near the Delaware River and New Jersey border. As for Wagner, Krause said he didn’t know enough about him. But he does like Wolf. Republican Tom Krause sits with his dog in Easton on Sept. 15, 2018. Sitting near Krause was 63-year-old Mark Moll. Like Krause, Moll lives outside of the city of Easton. He plans to retire from his job at UPS next month. He didn’t vote for Trump and doesn’t like him. But the Wolf vs. Wagner contest feels like a close one for Moll. He doesn’t think Wolf is doing a bad job. Wagner seems like a pretty good guy to him. He figures he probably will wait to Election Day to decide. Ed Mahon can be reached at 717-421-2518. In a statement, Wagner told PennLive that the story “is an analogy that illustrates voters don’t really care what types of flaws their leaders have, as long as they are getting things done for the people they serve. The raccoons do not represent any type of person – they represent the problems.” And a Wagner spokesman told Philly.com that Wagner wasn’t aware of the Infowars article and that he told a version of the raccoon story that was forwarded to him in an email. Here’s a look at some other factors when it comes to enthusiasm in the November election. Statewide: In 2016, Republicans won 13 of 18 congressional seats in Pennsylvania. But newly drawn congressional maps have given Democrats better odds in races across the state. Erie: Under the new map, Erie is in one congressional district: the 16th. Democrat Ron DiNicola is challenging Rep. Mike Kelly, a Republican. The Cook Political Report says it is a competitive race but leans Republican. Libertarian candidate Ebert G. “Bill” Beeman also filed to be on the ballot. Luzerne: Under the new maps, the county remains split, although in a different way than before. Republican Dan Meuser is favored against Democrat Denny Wolff in the 9th district. The Cook Political Report says it is a solid Republican district. Meanwhile, in the 8th district, Democratic Congressman Matt Cartwright is competing against Republican John Chrin. The Cook Political Report rates it likely Democratic. Northampton: The county is now contained in one congressional district, one that also includes all of neighboring Lehigh County and part of Monroe County. Democrat Susan Wild, Republican Marty Nothstein and Libertarian Tim Silfies are competing for the vacant seat in the 7th district. It leans Democratic, according to The Cook Political Report. A higher percentage of registered Republicans turned out to the polls in May, although Democrats, unlike Republicans, didn’t have contested primaries for governor and U.S. Senate. Here’s a look at turnout.